In-form Northants opener Ben Duckett says his 101 not out against Kent at Beckenham on Tuesday is ‘the toughest’ century of his career so far. Replying to Kent’s record-breaking first innings 701 for seven, with Sean Dickson making a remarkable 318, Duckett guided the County to 180 for one at close on the second day of the Specsavers County Championship Division Two clash. Rob Newton was the only Northants man dismissed, being caught off the bowling of Pakistan leg-spinner Yasir Shah for 57, but Duckett admitted it had been tough, tough going, and the County are going to have their work cut out to avoid defeat over the next two days. “It’s obviously going to be a big challenge,” said Duckett, who completed a second ton in consecutive Championship matches, following on fron his first innings century in the win over Leicestershire last week. “It’s going to be tough against Yasir especially, as he’s bowling it into the rough at both ends and it’s spinning big out of there. “I think that’s the toughest hundred I’ve scored in my career to date. “I was very tired after all that fielding, but I felt I had a good game plan against the Kent bowlers and you could see what that hundred meant to me by the way I celebrated it. The fact the County are so far behind the eight ball at the halfway stage of this encounter is largely down to Dickson, who plundered that 318. It is Kent’s highest individual score on home soil, and he put on 382 with Joe Denly in the biggest partnership in the county’s history as a host of records tumbled. Kent’s 701 for 7 declared was also their highest first-class total in Kent, and it left Northants with an uphill battle to secure a draw in this clash between the third and fourth-placed sides in division two. Dickson, a 25-year-old South African UK passport holder whose mother, Pat, hails from Beckenham, fell just 14 runs short of Bill Ashdown’s Kent individual record of 332, made against Essex at Brentwood in 1934. But he at least passed Ashdown’s 305 not out, against Derbyshire at Dover in 1935 and Kent’s previous highest in a match at home, while Kent’s total was their second highest in first-class cricket behind the 803 for 4 declared made in that same Brentwood game 83 years ago. Dickson faced 408 balls, across almost eight and a half hours at the crease, and hit three sixes and 31 fours. Denly scored 182, from 226 balls and with five sixes and 15 fours, and it was his cracking hook for four, off Nathan Buck, which took the partnership with Dickson to 369 and – in one stroke – past two previous Kent record stands. They were the 366 that Simon Hinks and Neil Taylor added for the second wicket against Middlesex at Canterbury in 1990, and the 368 that was the previous highest partnership for any Kent wicket, by Aravinda de Silva and Graham Cowdrey for the fourth wicket against Derbyshire at Maidstone in 1995. Denly holed out in the deep off Rob Keogh’s off spin after adding 39 in 55 minutes to his overnight 143, but Dickson kept going as the Northants bowlers struggled to hold back the tide of runs on a featherbed pitch. Dickson, who resumed on 210 in Kent’s overnight 434 for one, accumulated remorselessely and soon went past the previous highest score made by a Kent batsman against Northants – Frank Woolley’s 217 at Northampton in 1926. 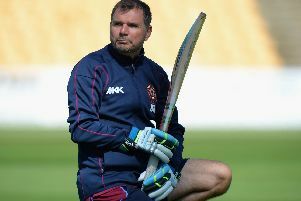 Next on Dickson’s hit list was Kent’s post-War highest individual score of 275, made by present county head coach Matt Walker against Somerset at Canterbury in 1996, and when he reached 300 he became just the second Kent batsman – after Bromley-born Ashdown – to score a first-class triple-hundred. Denly had set the tone for another run-filled day at Kent’s northern headquarters by pulling Ben Sanderson for four in the day’s first over and he then drove Graeme White’s left-arm spin for six. Kent scored 169 in 33 overs in the morning session, and another 98 in 14 overs after lunch before finally calling a halt to the carnage. Sam Northeast contributed 38 to a third wicket stand of 68 in 15 overs with Dickson, who eventually skied Max Holden’s occasional off-breaks to long on. Sam Billings helped himself to a quickfire 42 in the push towards the declaration as he, Matt Coles (24) and James Tredwell, who pulled Holden for six to bring up Kent’s 700, enjoyed themselves in the afternoon sunshine. Duckett, who made 208 in this fixture and on this ground last season, led the Northants reply with a well-judged mixture of watchfulness and aggression, and the closest he came to losing his wicket came when he snicked Mitch Claydon wide of third slip on 11 and, later, edged Matt Hunn just short of second slip. Newton also had a few early scares against Claydon, who bowled a testing new ball spell, and on 20 was beaten by a ball from Shah that turned sharply. Shah later switched ends to find some purchase out of the bowlers’ footmarks, but Duckett emerged intact from an uncomfortable spell against him in the closing overs and lofted Denly’s leg spin over mid off for his 16th four to reach a 153-ball hundred. Alex Wakely, the Northants captain, also battled hard to get through to stumps unbeaten on 14, but a long two days still lie ahead for Northants. Dickson said: “It’s just overwhelming at this stage of my career. “This is only my second full season in first-class cricket and I don’t know how I did that. “I’m excited to see what is to come now, and hopefully I can get the chance to beat Kent’s highest score another time! “I scored a hundred for my club in the Kent League on Sunday so it’s been a magical week. “It might all hit me in a week or so’s time, but it’s great to get a triple hundred and it was more a mental thing than a physical fitness situation out there. “My mum came over from South Africa last year and showed me the street near here in Beckenham that she lived in as a child, and the school she went to, and she dropped me a text last night when she saw I had scored a double hundred saying she had burst into tears when hearing the news. And Dickson is also confident Kent can still get the 19 wickts they need to force vicory. “It’s only the end of day two and already the pitch is doing a few funny things,” he said. “We just have to be resilient in the field and make them work hard for their runs. “We are only a few wickets away from getting into their all-rounders and Yasir Shah will be difficult to face in the last couple of days.